Have you ever visited a friend and you had dinner or lunch at their favorite neighborhood restaurant? After eating you thought… wow, I wish we had a restaurant like this where I live! Since our company was established in 1982, Dagwood’s has become the neighborhood restaurant of choice. Many people frequent Dagwood’s for the award winning pizza. 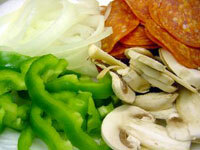 While others prefer the calzones, homemade pastas, sandwiches, black Angus burgers, salads or wings. Due to national trademark registration our name has been changed to Dag's Pizza and Grill. If you’re looking for a local business opportunity that gives you independence and security, affords you a great lifestyle and provides the opportunity to serve the needs of your community, you don’t need to look further. Dag’s Pizza and Grill is the answer! When you own a Dag’s Pizza and Grill franchise you soon will become a neighborhood favorite by offering home cooked food at reasonable prices in a comfortable atmosphere. While many restaurants have experienced a drop in sales over the past few years, Dag’s Pizza and Grill has experienced double-digit sales growth. When you become a Dag’s Pizza and Grill franchisee we will provide the business model and support designed to maximize profits, increase average check and maximize revenue streams beyond the restaurant to take-out, delivery and catering. Our experienced corporate office staff will provide the support throughout the process including site selection, equipment ordering, training, operations and marketing support. We are currently offering franchise opportunities in Georgia, Florida, Tennessee and Alabama. For more information contact: Joe McCord at 800-220-8256; 770-249-3773 or via email at jmccord@franchisedoc.com.